Mitsubishi Motors today announced details for the fuel-efficient 2017 Mitsubishi Mirage featuring a new exterior design, improved performance and enhanced interior appeal. Despite all that is new for Mirage in 2017, a few things didn’t change at all—Mirage still offers impressive fuel economy, attractive pricing and industry leading new vehicle and powertrain warranties. 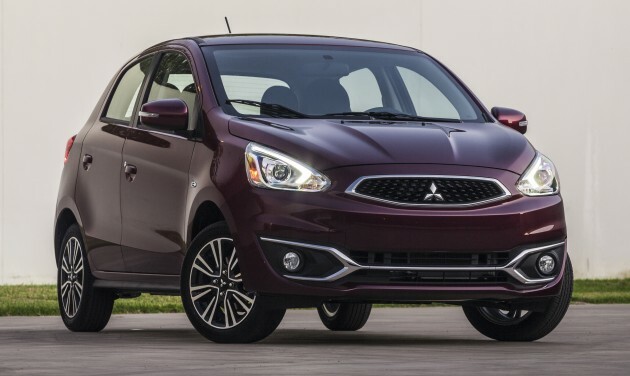 The Mitsubishi Mirage hatchback will be available at dealers in spring 2016. Mirage’s handling and brakes are improved for 2017 as well. Optimizing the spring rate and damping force of the shock absorbers while adding stiffness to the front end achieve handling and stability improvements. In addition, bigger diameter brake discs (251 mm) are used in the front and the rear brake drums (203 mm) have increased 23 millimeters. The brake pad/shoe material has also been changed for even better stopping performance. Every 2017 Mirage comes equipped with a wide array of safety features and technologies. These include a seven air bag Supplemental Restraint System (SRS) comprised of dual front air bags, dual front seat-mounted side-impact air bags, dual side-impact curtain air bags, and a driver’s knee air bag; 4-wheel anti-lock brakes (ABS) with Electronic Brake-force Distribution (EBD) and Brake Assist; a Tire Pressure Monitoring System (TPMS); and Active Stability Control (ASC) with Traction Control Logic (TCL). Mirage models equipped with the continuously-variable transmission-equipped (CVT) also include Hill Start Assist (HSA).